Green Lantern Corps is a title in which I didn't have much interest in the 1980s, but that came to be very important to me in the 2000s under Dave Gibbons and then Peter Tomasi and Patrick Gleason (introducing me, among other things, to the work of Tomasi and Gleason). In that vein I take volumes of Corps seriously, and while there was nothing overtly objectionable about Corps's recent fourth volume (the first in a while without Tomasi), neither did Van Jensen's first outing on the title truly excite me. The next volume, Green Lantern Corps Vol. 5: Uprising is an improvement, where I think Jensen, artist Bernard Chang, and colorist Marcelo Maiolo begin to gel more than previously. But further, Jensen got me with three big surprises in this book, two of which are direct call-outs to the early Gibbons/Tomasi Corps era. Maybe that's pandering, but with just one more volume before Corps's end, I'll take it. Tying up some of Green Lantern Corps's longest-standing pre-Flashpoint dangling plot-threads equals an enthusiastic review in my book, indeed. Even despite already knowing that the "Uprising" crossover with Green Lantern would involve the shape-shifting Durlan war with the Corps, I never thought back quite so far as to consider the writers might revisit Durlan Green Lantern Von Daggle, last seen a little short of a decade ago in the pre-Flashpoint Green Lantern Corps: Dark Side of the Green, from a fill-in story by Keith Champagne during the Gibbons era. That would be thrill enough, but just a few issues later Jensen has the Corps plumbing the depths of a remote Durlan prison only to find ... Sodam Yat, the Daxamite Green Lantern heavily involved in such events as the Sinestro Corps War, last seen in comics maybe four or five years ago but really not in active use for more like six or seven. And Jensen has Yat's former romantic interest Arisia on the page, too! At that point, with Jensen and Green Lantern writer Robert Venditti spinning a Lantern event that resurrects both Von Daggle and Sodam Yat, there's very little else a Green Lantern Corps fan might ask for. But at a time when true surprises are somewhat rare in comics, Jensen gets me not just these two times, but also a third, when he reveals poor John Stewart's girlfriend, the Star Sapphire Fatality, to be a Durlan in disguise. Despite knowing the Lanterns' enemies were shape-shifters, and despite that at one point it seems every other Lantern is a Durlan, shame on me for not foreseeing Jensen and Venditti would "turn" a major member of the supporting cast. How exactly Stewart became the emotional football of the Lantern titles, I'm not sure, but he's got the roughest luck, and Jensen's final issue of the collection in which the real Fatality subsequently rejects Stewart is wonderfully wrenching. Kudos to Jensen for bringing it all to a head quickly, which I think held more emotional impact than had Stewart's hunt for Fatality been drawn out for months. Uprising collects a Corps annual, the three-part Daggle story (which also explains the origin of the Durlan/Lantern Corps conflict), the six-part "Uprising" (with three each issues of Corps and Green Lantern, included here), and that one-issue epilogue. Though there's some pretty great wide-screen Lantern action on Venditti and artist Billy Tan's side, "Uprising" is arguably Corps's story, and a lot of it has to do with that final Fatality twist. At the end of part five, "Uprising" is essentially over and done with, the enemy has been defeated ... and then Lantern Hal Jordan gets a panicked call from Stewart that links up with Stewart's fight with the Durlan Fatality in part six. At that point, "Uprising"'s scope narrows considerably to hone in solely on Stewart, leaving a stronger impression of Stewart as the focus character despite Jordan's strong presence elsewhere. Jensen also does interesting work in the annual, which parallels the Corps' deliberations over teaming with some of their greatest enemies against one-or-two-page origins of the villains themselves. Of all the strengths of Geoff Johns's Green Lantern run, it was noticeably short on day-to-day rogues for Hal Jordan, notably ones here like Evil Star and the Faceless Hunter. I still can't say I fully understand Evil Star's power set and I miss his star-headed cowl, but at least he's in the book. Jensen also uses to great effect the boisterous Bolphunga the Unrelenting, in a way that makes it unfathomable no other writer's used Bolphunga as an anti-hero before (Bolphunga being another one last used around Emerald Eclipse before reappearing here; Jensen and Venditti are reading the right source material, and how). I remain of two minds about the artwork of Bernard Chang, which I sometimes find too sparse and lacking in detail for my tastes, and the colors of Marcelo Maiolo, purposefully monochrome and garish, and often in stark red in contrast to the Lanterns' green. But it's obvious it's all being done with intention, and while Tan in Green Lantern might be more my speed, I can respect Chang and Maiolo trying to do something different. In panels where Maiolo has not altered the colors for effect, I felt Corps this time looked warmer and better toned than Green Lantern Corps Vol. 4: Rebuild, and so maybe it's just been a matter of growing pains. Chang and Maiolo have moved to Dan Jurgens's Batman Beyond now, and I'm curious to see how their particular style works there, on a title that doesn't already have an existing green color scheme built in. Green Lantern Corps Vol. 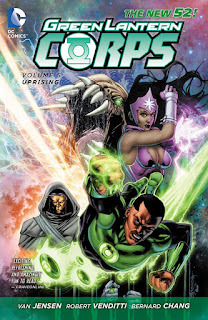 5: Uprising includes the same "Uprising" issues as Green Lantern Vol. 5: Test of Wills, so the audience can read that story in either book. Lantern has going for it some good Red Lantern crossover material, but in all the lead-in material to "Uprising" is better in Corps than Lantern (in "Uprising" itself, both titles fare well). Van Jensen's good outing here and the overall goodness of the "new team" Green Lantern titles makes me eager to continue to the "Godhead" conclusion. I just realized that your graphic novel collection must look spectacular on the wall/shelf.